Visibledust is proud to announce the introduction of new digital medium format swabs specially designated to fit Leica S2 and Pentax 645 medium format sensor size cameras. 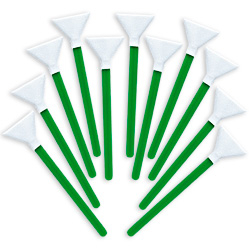 This medium format swabs are designated for sensor sizes ranging from 3o to 33 mm in width or vertical length of the sensor. Therefore, one has to ignore the horizontal length of the sensor as the swab moves from left to right or vice versa during the cleaning process.